I live in an apartment, so giving out candy to little kids on Halloween was never a concern my folks (or me) had to deal with. I guess that's a blessing in disguise: We didn't need to spend money buying plastic bags of candy wrapped in more plastic. I do, however, have fond memories of going trick or treating myself. So I wasn't completely waste free as a child, despite the fact my parents never had to buy stuff for trick or treaters. I still live in an apartment today - the only difference is I don't go trick or treating anymore. Instead, I usually just spend the holiday wearing cat ears and watching a semi-scary film with my boyfriend (he's not big on horror). I'm grateful for this simplicity, considering Halloween is a really hard time of year for the environment. All those plastic wrapped candies, single use costumes, and rotting pumpkins really add up. 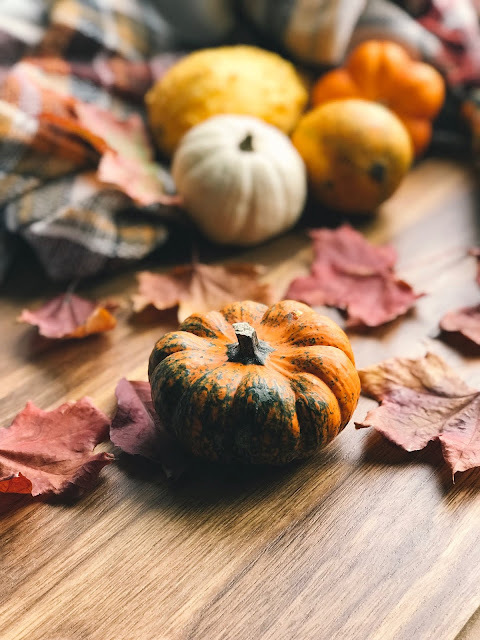 That's why I decided to devise a zero waste Halloween guide that would help you navigate this spooky holiday. I've provided a list of zero waste candy options, zero waste costume ideas, zero waste Halloween decor and zero waste Halloween recipes to chill your bones. No matter what you're doing this Halloween, you can use this handy guide as a reference to make the best possible decisions. 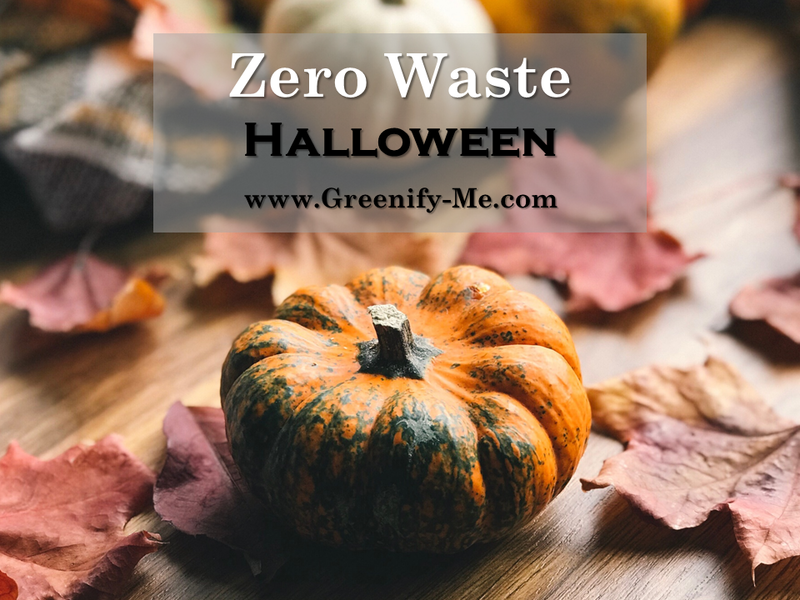 Ready to celebrate a zero waste Halloween? Enter if you dare. As soon as fall hits, all the CVS' are packed with big plastic bags full of candy wrapped in more plastic. It literally makes me gag. It's safe to say I avoid those aisles at all costs. However, I know many people don't want to look like the neighborhood grouch so they can't help buying candy to give out. This is totally understandable, but there are better, more plastic free options available. Opt for candy in recyclable cardboard containers: Dots, Nerds, Good and Plenty, Runts, Mike and Ike, Whoppers, Milk Duds and Junior Mints are all good options that come in cardboard boxes. I'm sure there are plenty others that do too: You'd have to explore your local candy store for them. Just be aware that some boxes may still contain a plastic film inside of it. Usually, if the box is smaller, it won't though, so try to get mini sizes if you can. You can even add a note to the box or write on it with marker, asking the trick or treaters to recycle the box at the end of its life. Go for chocolate wrapped in foil or fair trade chocolate bars: I loved receiving chocolate as a kid while trick or treating. But now, all those plastic wrappers really are a kill-joy. Opt for purchasing foil wrapped chocolates to hand out instead. The foil can be easily recycled. You could also try buying fair trade chocolate bars wrapped in paper. However, these can get a bit pricier, as a general rule. Consider giving out non-edibles: Another way to skip the candy altogether is to give out non-edible items that are still fun for kids to enjoy. Have you ever heard of the Teal Pumpkin Project? The Teal Pumpkin Project is a national campaign that was launched in 2014 by the organization Food Allergy Research & Education (FARE). The color teal has been used for nearly 20 years to raise awareness about food allergies and the severity of this medical condition, which made it the perfect choice for representing their Halloween campaign. To participate, simply place a teal pumpkin (or a printed sign from FARE) outside your house as a signal to trick or treaters that you're giving out non-food items. Some ideas for items you could give out include Halloween erasers, pencils, word search or crossword puzzle books, seed packets, and bracelets. 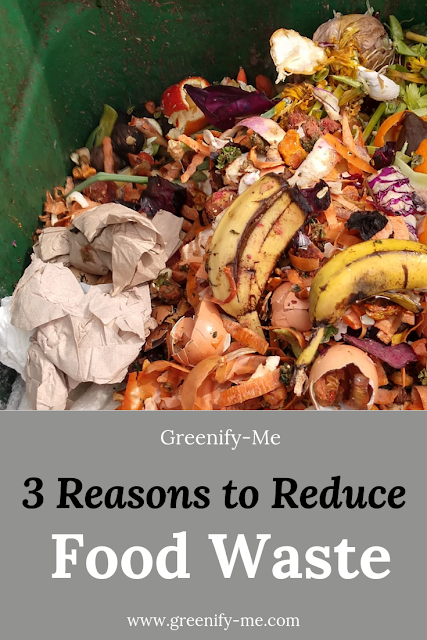 These items create far less waste while also still serving a purpose. Give kids ways to upcycle their candy: If you have to purchase conventional candy, for whatever reason, provide each child with a card with upcycling ideas. There are so many ways to upcycle candy wrappers that you could list such as making candy wrapper jewelry, a candy wrapper pouch, or candy wrapper origami. You can get as creative as you like and write down hyperlinks to websites with further instructions as well. Organize a Terracycle collection sight in your neighborhood: Terracycle has a candy wrapper zero waste box available for purchase that you can fill and return to them to be recycled. These boxes are very expensive, so organizing a collection sight in your neighborhood is much more feasible. Reach out to a local grocery store to see if they would sponsor a box to carry in their store until it's full. You can just shoot them an email explaining who you are, that you go to their store all the time, and why you think having this box around will be a good idea. Offer to promote them on your social media accounts, spread the word to friends and family, and advertise the program on a small card provided to all trick or treaters: This will make them more likely to say yes. 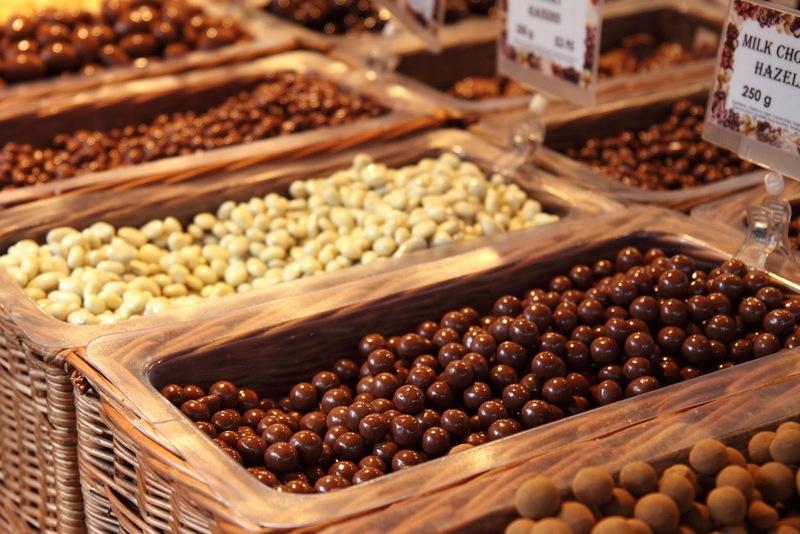 Buy your candy in bulk: If you have access to a bulk food store, chances are they have a section dedicated to candy and chocolate. I know mine does! All you need to do is bring some mason jars with you and fill it up to your heart's content. Some candy stores also have bulk bins you can utilize for this purpose as well. Opt for loosely packaged candy that doesn't have any wrappers around them whenever possible. Just pack them in mini paper bags and hand them out to kiddies throughout the night! Make sure to label exactly what they are so no one is confused. Make your own treats: If you're super well known in your neighborhood, or hosting your own Halloween party, you might want to consider making your own treats. For some spook-tastic ideas, head on down to the zero waste Halloween recipe section. Of course, I wouldn't recommend doing this unless everyone in your community trusts you, as it could result in many complaints and much suspicion. 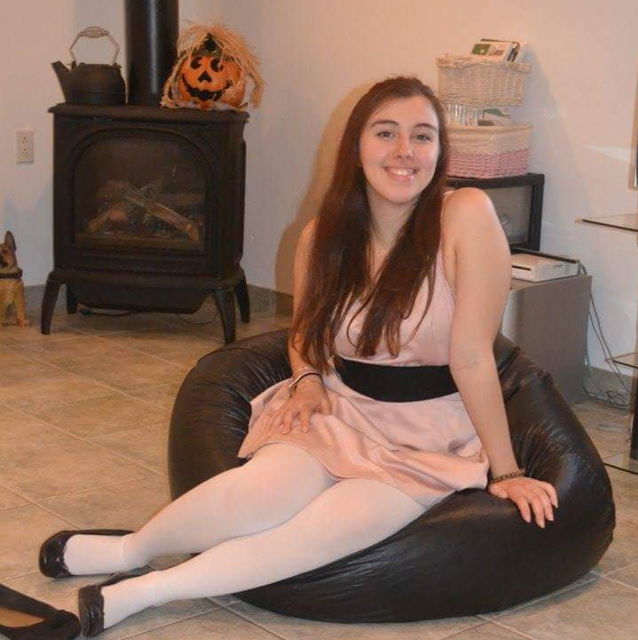 Throwback to the year I dressed up as Blossom from the Power Puff Girls! All it called for was a pink dress, black scarf (for wrapping around my waist), a red bow, white stockings, and black shoes. I already had everything and only had to buy the dress, which I still have and can wear for other occasions. Going to a Halloween party? Have some trick or treaters living in your house? Just like to dress up? Halloween costumes are definitely going to pop up. However, buying an outfit you're bound to wear only once is incredibly wasteful. Not to mention, Halloween costumes typically aren't made from sustainable fabrics. Thankfully, there are other, eco-friendly options. Look through your closet first: You might have a potential costume already in your wardrobe. Have a pair of black pants, black boots and a black long sleeved shirt? You've got the base to create a black cat costume. A green dress? The base of a tinkerbell costume. I don't know about you, but I have a few character themed shirts lying around my house (Sonic and Superman to be exact). Work from that and get creative: One of my favorite things to do is create "looks" inspired from my favorite characters. So for a "Sonic look" maybe I'd wear my Sonic t-shirt, red shoes and some blue eye shadow. Catch my drift? My boyfriend did something similar one year by wearing a superman shirt under a nice button down shirt. It created a nice 'Clark Kent' look and it was fun whenever he'd unbutton his shirt to reveal the superman logo underneath. Go to the thrift store: You can find some really awesome looking clothes at a thrift store. In fact, who's to say you can't find a costume there? All you need is an open mind and a little creativity. Find an old wedding dress? Go as the corpse bride. A plaid shirt? Go as a scarecrow. Use that imagination of yours to compile the perfect costume based on what you find. You can obviously go into the thrift store with an idea in mind and see what they have that way too. Whatever you find, it's bound to be a lot cheaper (plus, you'll be keeping it out of the landfill). Reuse old costumes: I have so many old costumes from previous Halloweens sitting in my storage closet. The sad part is I only wore them once. If this is true for you too, rummage through your old costumes and try them on. Does one still fit? Wear that instead of buying new! It's so much better for the environment and your wallet. Plus, no one is going to remember you were a cat for Halloween four years ago, trust me. Host a costume swap: Not liking any of your old costumes? See if you can gather a group of friends together to swap old costumes with. You never know what you'll find to your liking, and it's a great way to reuse old items. Make it an event in and of itself so it's fun for everyone. Use eco-friendly face paint: If you have to use face paint at all, try to avoid the ones you can buy in-store. They're filled with toxic ingredients you shouldn't be putting on your skin to begin with, not to mention packaged in plastic. For more information, check out my post on why you should avoid face paint this Halloween. You can also make your own face paint using natural ingredients. These zero waste Halloween costumes can probably be found in your very own closet, or bought second hand and reused for other events. Going Zero Waste also has a great post all about ethical Halloween costumes you should totally check out. Cat: Black leggings/pants, black long sleeve shirt, black boots, cat ears. Scarecrow: Straw hat, plaid shirt, denim jeans, work/rain boots. 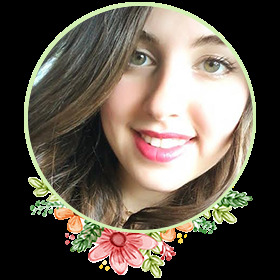 Hippie: Bell bottom jeans, tie dyed shirt, flower crown. Burglar: Striped white and black shirt, black leggings/pants, black shoes. Mary Poppins: White button down shirt, long black skirt, black hat, red bow tie, black umbrella. Ghoul: Any clothes you don't mind getting dirty, fake DIY blood made from natural ingredients (beet powder or cherry juice mixed with corn starch make realistic looking fake blood). Who said Halloween decor had to be a scare fest for the environment? Don't go buying new Halloween decor every year just to stay spooky. That's just a waste of resources (and money). Buy some gourds + sugar pie pumpkins: Gourds on their own are absolutely beautiful with their unique shapes, colors and sizes. You can arrange them just about anywhere for decoration: On your windowsill, front porch, dining table, fire place, desk, etc. Also, instead of buying plastic pumpkins, buy real pumpkins. Organic sugar pie pumpkins are great because you can decorate with them, then turn them into dessert when they've served their purpose. And who doesn't love a multi-purpose item, right? For a delicious pumpkin soup recipe, check out the zero waste Halloween recipes in section 4 (below this one). Carve a jack-o-lantern and waste nothing: Often times, while carving a pumpkin, things can get a bit wasteful. You may throw out the pumpkin guts, carvings, or seeds, but there's really no need to. You can set the seeds aside for roasting (or planting if you have a big enough backyard). They make great snacks and can be sprinkled into so many dishes (pumpkin soup anyone?). Also, be sure to compost the inside of the pumpkin and any chunks of pumpkin you had to cut out to make your jack-o-lantern. When the jack-o-lantern has seen better days, you can compost it as well. Use tea lights to cast that spooky glow instead of going out and buying fake lights. Trust me, tea lights look even cooler. Reuse old decorations from last year: My family likes to keep a lot of decorations from previous years and holidays in storage. We always break them out every year: It saves us a buck and keeps items out of the landfill. Plus, we don't have to buy cheap plastic decorative items that will probably just wind up breaking or being a waste of money. Decorate using natural materials: There are so many ways to decorate your house using natural materials such as dried corn on the cob, hay, sticks, and even dryer lint (instead of those fake spider webs made from cotton). For some ideas, check the list I made below. These ideas utilize upcycling, nature and natural ingredients. Make a reef out of fallen multi-colored leaves. Take some empty glass jars and write 'witches brew' using a marker on them. Fill them up with water and add natural food coloring to them (beet powder will make red-pink, spirulina powder will make green, and turmeric will make yellow). Give them a shake and let them sit somewhere others can see them. Arrange a plant display using fall leaves still attached to their branches (snipped only from a tree that needed pruning and put in a vase with water). Place some sticks in a black vase or black empty wine bottle. Using a white marker, write on the glass "magic wands". Place some gourds and pumpkins around some candles and fallen leaves you collected from outside. 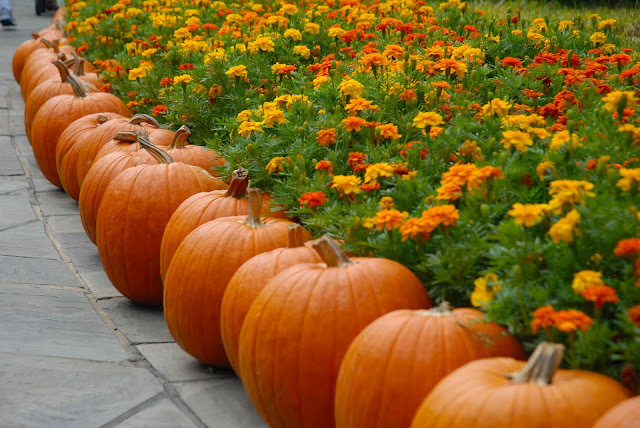 Decorate your outdoor steps with pumpkins, chrysanthemums, and gourds. Line your steps with candles you light only at night to create a beautiful, autumn glow. Draw and color some spooky pictures if you have any artistic talent and hang them all over your home. Utilize any art supplies you already have at home to do this instead of going out to buy more. Some fun things to draw include: Frankenstein, ghosts, vampires, werewolves, bats, cats, pumpkins and the moon. You can even have them laminated to use and hang every Halloween, if you feel they're good enough. Cut open a pumpkin, composting the top and insides (saving the seeds for cooking or planting). Place some fall-colored flowers (yellow, gold, red, orange) inside it, cutting the stems if need be (and composting them). Makes a great center piece. Collect some acorns and put them into a tall glass vase. Place a white tea light candle with protective glass around it inside the vase so it's sitting on top of the acorns. Make gourd candles by carving a hole for tea lights to fit into. Fill a wooden bowl with harvested pine cones. In the center, place a tall glass vase and a pillar candle that is an autumn color (like orange, red, or yellow). Make branch candles by drilling a hole into the branches using a large drill bit. Place tea lights into the holes. Make DIY leaf stamped napkins by collecting some nicely shaped leaves outdoors. Pick out some nice white cloth napkins and craft paint in your color of choice. Just paint one side of the leaves using your brush, then gently place it onto your napkin in the area you want stamped. Lay another towel over it gently so it doesn't make a mess. Carefully roll over the towel/leaf with a rolling pin so the paint transfers over to your napkin. Remove towel and leaf to reveal your beautiful print. Hosting a party? Going to a party? Cooking a spooky meal for your family and staying in? 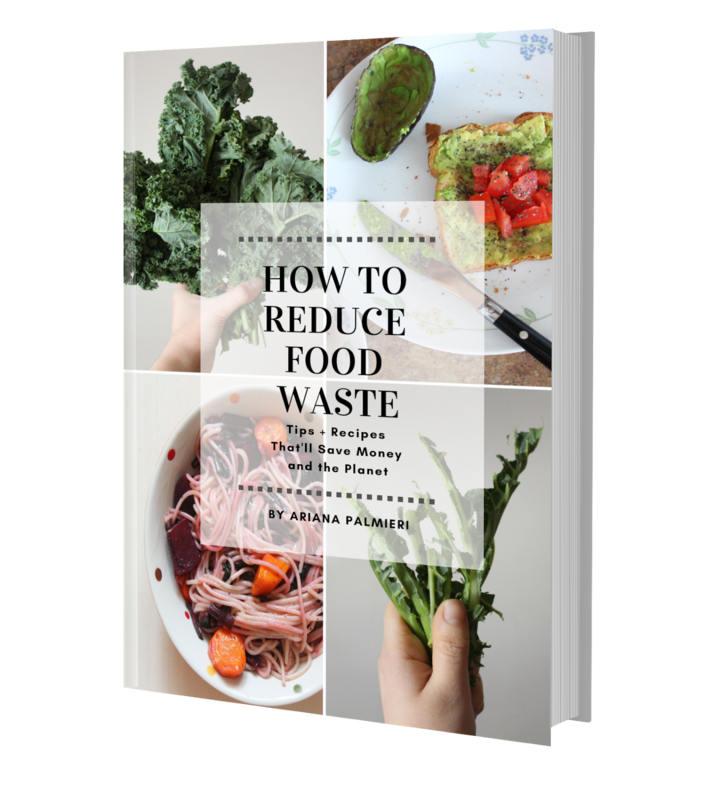 Whatever the case, I've got a few zero waste recipes to please your palate. I've rounded up four delicious recipes perfect for serving this Halloween. Most make great appetizers, but one is a hearty meal worthy of the Pumpkin King himself. These cute, simple finger foods are perfect appetizers. Peel a ripe banana half-way down and then cut it. The top of the banana will be your ghost's body. Feel free to eat the other half and compost the peel. Now take three raisins and arrange them into the face on one side of the banana. Use the peanut butter to "glue" them into place. Arrange these cute ghost bananas on a platter for friends and family to eat as finger food. A healthy treat that's the perfect appetizer to any party. Great for kids too! Peel the tangerine completely and set aside. Compost the peels, or save them to make some orange peel vinegar cleaner (you can use any citrus peels to make this all-natural cleaner). Cut the celery into thin and short strips. These will be the stems of your 'pumpkins'. Insert the strips of celery into the middle of the tangerine. Set out next to the banana 'ghosts', if also making. These make great finger foods at parties, or treats for kids. Such a simple, but yummy, appetizer. Pairs well with raw vegetables (broccoli, carrots, bell peppers) and homemade crackers. Put some hummus in a bowl. Then, take a black olive and cut it in half length-wise. Place one half of the olive (flat side down) on top of the hummus. Cut the other half of the olive into 6 small strips that will be the spider legs and arrange them around the larger half of the olive in the bowl of hummus. Repeat as many times as you like to fill the hummus with those olive spiders. I've adapted this pumpkin soup recipe from Half Baked Harvest to be a lot more simple and more zero waste friendly. Feel free to check out the original recipe if you'd like to spice things up! Note: All seasoning such as cayenne pepper, nutmeg, red pepper flakes, etc. can be found at your local bulk food store. If you don't have access to that, try buying them in glass packaging. Unsalted butter sticks come in waxed paper you can compost. You can also get the pumpkins, thyme and shallots at your local farmers market, plastic free. First begin by preparing the roasted pumpkin soup bowls. Remove the tops of the small pumpkins and scoop out the seeds. You can roast the seeds on your own time to top the finished product with, if you'd like. Rub the insides of the pumpkins with olive oil, salt and pepper. Place on a baking sheet and bake until soft to the touch but not falling apart (approximately 20 to 30 minutes). Next, it's time to start making the soup. Preheat the oven to 400 degrees F. Cut your big pumpkin in half or into fourths. Reserve seeds for later so you can roast them, along with the others you harvested from the smaller pumpkins. Place the pumpkin on a baking sheet and rub the pumpkin with 1 tablespoon olive oil and sprinkle with salt and pepper. Roast the pumpkin for 45 minutes, or until the pumpkin is fork tender. Remove from the oven and allow to cool five minutes. Heat a large pot over medium heat and add the butter and shallots. Saute the the shallots until soft, about 5 minutes. Add the thyme and cook another 30 seconds. Add the pumpkin puree, remaining chicken broth, coconut milk, water, cayenne, nutmeg, maple syrup and crushed red pepper. Bring the soup to a low simmer and simmer 15-20 minutes. Roast the pumpkin seeds you harvested earlier from all the pumpkins with a little salt and pepper to your liking. Peel the shells off when done roasting and sprinkle some into the soup. Make sure to compost the shells. 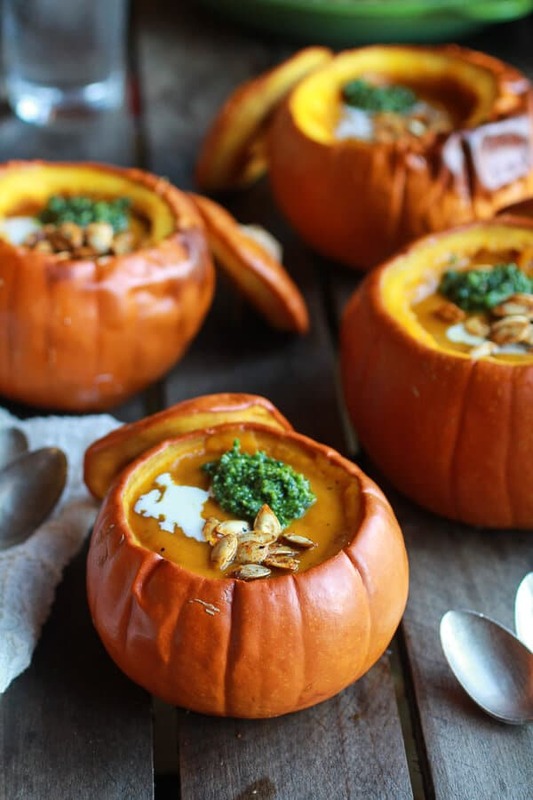 Ladle the soup into your pre-made pumpkin bowls! Sprinkle some de-shelled pumpkin seeds and serve. When your guests are done eating, be sure to compost the pumpkin bowls immediately. There you have it. Did you enjoy this zero waste Halloween guide? How are you spending Halloween this year? Love your post! Halloween has always troubled me due to health concerns, working conditions for people producing chocolate and other treats, and the utter waste of all of the decor and costume. Thanks for your insights!